Family of CAL-AV springs. From front to rear: Mark-5, Mark-6, and Mark-7. 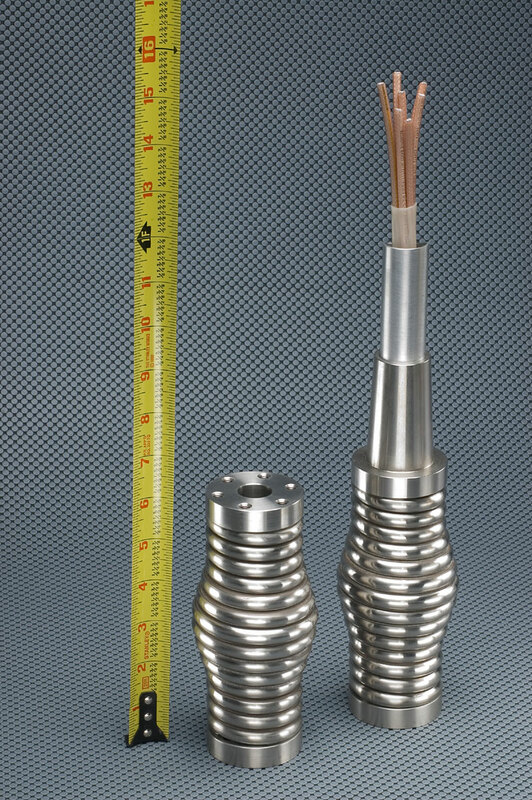 From left to right in each size: Threaded end, Universal Through-hole (UTH), and Mast Socket. All versions available in mil black oxide. Contact factory for details. CAL-AV LABS produces a family of mobile antenna springs comprising the Mark-5, Mark-6, and Mark-7. 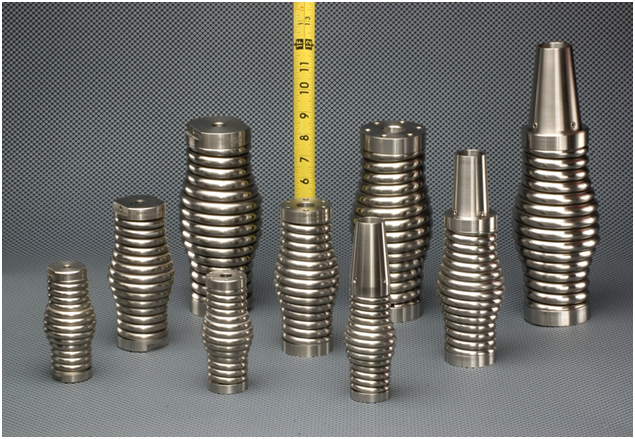 These model series represent three basic sizes: 4.65 inches high for the Mark-5, 6.9 inches for the Mark-6, and 8.45 inches high for the Mark-7, each in its threaded-end style. 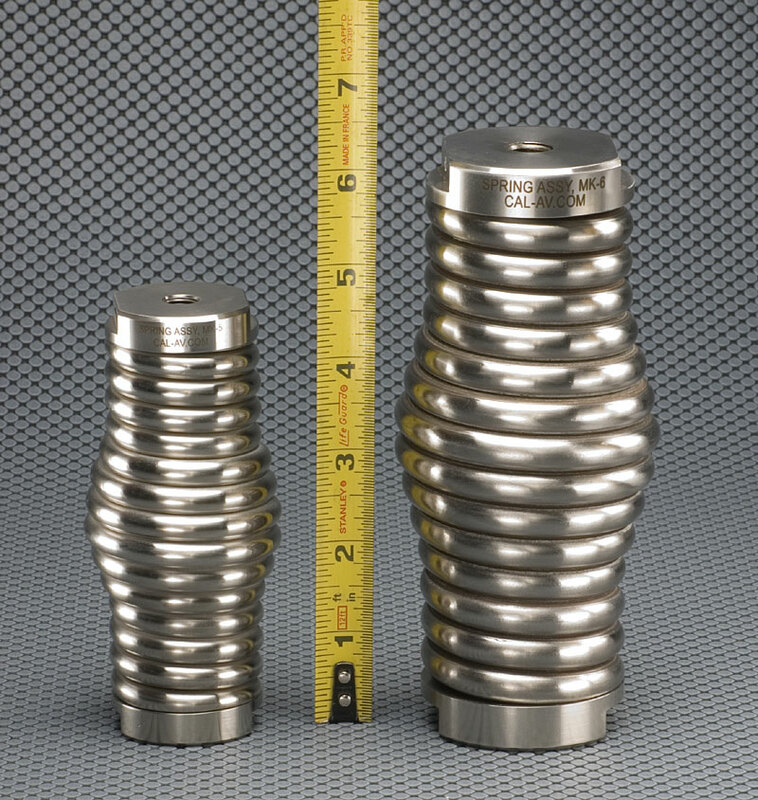 These are commercial grade springs of polished, all-stainless construction, except for the internal tinned-copper braid, which bonds their end pieces for high frequency applications. Threaded at each end, e.g. for mounting a whip antenna. Each of these threaded-end springs has an internal tinned copper braid bond between its end pieces. 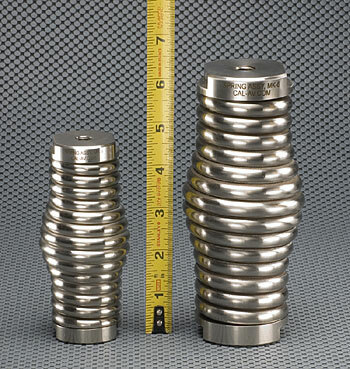 Each size has one standard thread size, plus other sizes available as options. Please see the specifications for each size for details. A “Universal Through Hole” (UTH), at each end, e.g. 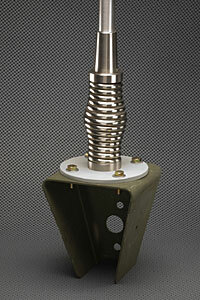 for mounting an antenna or mast so that a coaxial cable(s) can be passed through the spring. 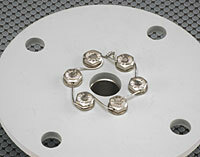 The UTH end has a central hole surrounded by a pattern of 6 threaded mounting holes. This style allows the spring to be mounted on an enclosure (e.g. 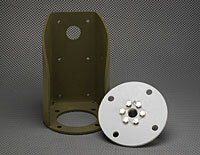 for a matching or switching function) and in turn, an enclosure, antenna, or mast can be mounted on the spring. Please see the specifications for each size for details. A UTH at one end, and a Mast Socket (MSA or MSB) at the other. This allows easy attachment of an antenna, radome, or mast directly to the spring, while allowing passage of the coax(s), control cable(s), etc. The Mark-5 and Mark-6 spring accommodate 1-inch O.D. masts, and the Mark-7 takes a 1.25-inch O.D. Masts are retained with set screws. Please see the specifications for each size for details. 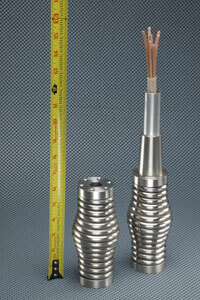 At left is a matte-finish standard Mark-6 HF antenna all-stainless spring assembly. 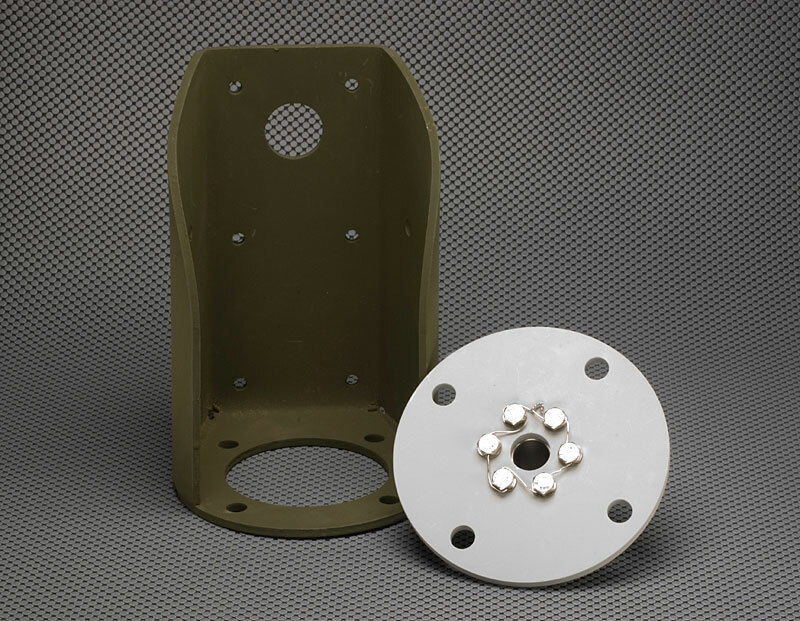 At right is a Mark-6 based custom mast / radome socket assembly for a military application. 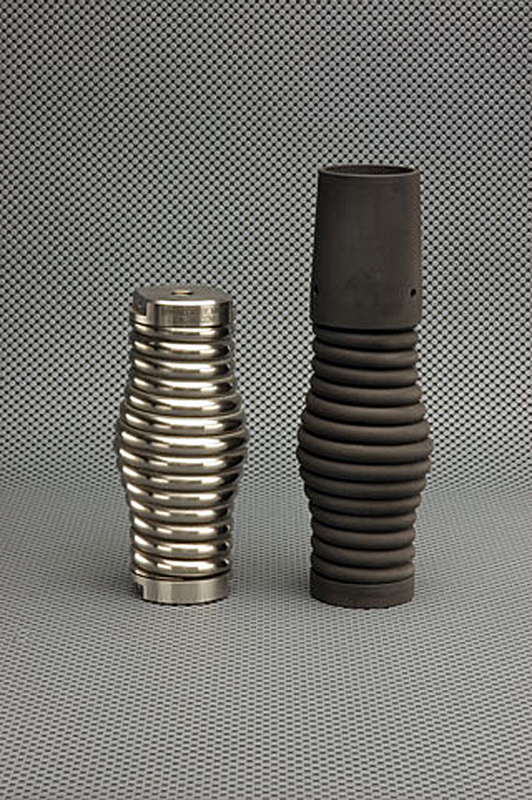 The low-reflectance finish on this all-stainless spring assembly is black oxide per MIL-DTL-13924, CLASS 4. CAL-AV welcomes inquiries regarding custom spring assemblies. Mark-6 with UTH each end on left; Mark-6 with UTH on bottom, Mast Socket on top to right. 1" diameter mast section with seven RG-303/U cables in sleeve, illustrates through-hole capability. Mark-6 with mast in socket above, UTH below, mounted on a SINCGARS adapter plate, which is in turn mounted on a vehicular SINCGARS mount. Underside of vehicular SINCGARS antenna mount and underside of SINCGARS to Universal Through-Hole (UTH) Adaptor Plate, showing safety-wired 1/4-28 bolts. Close-up of safety-wired 1/4-28 bolts holding Mark-6 UTH base to SINCGARS adapter plate. holes for 10-32 screw, every 60 degrees on a 0.660 bolt-circle radius. holes for 0.25” bolt, every 60 degrees on a 0.830 bolt-circle radius. Also available: Pairing plates; allows pairing two springs side-by-side to double spring constant fore-and-aft, while virtually eliminating side motion. Stainless steel. Intended for mounting on a trailer hitch. Contact factory for details.